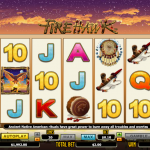 Fire Hawk is a video slot game that allows you to see how it is like to be the Chief of Red Indian Tribe. This game comes from the crafty hands of Nextgen Gaming and it is a great masterpiece. The reels are set in the orange sunset with the starlight sky and the sound effects are complementing the theme in the perfect way. Fire Hawk has couple of symbols and features that will make the game play epic. The chief himself is the wild symbol and its function is to substitute for every other symbol except the scatter. The wild appears only on two reels, and the one that appears on the second reel has x2 multiplier and the one on the fourth reel has a multiplier x 4. If both wilds contribute to a win than your win will be a subject to a x 8 multiplier. The Fire Hawk is the scatter and to activate the free spins you need to land at least 3 scatters. Then you have a choice to make about which feature you want to play. 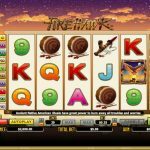 You can choose between 10 free spins with x4 multiplier, 15 free spins with x3 multiplier and 20 free spins with x2 multiplier. Fire Hawk turns out to be a simple yet very entertaining game. 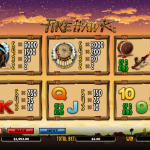 The game play is straightforward and the features are easy to activate. What else would you look for in a game? We know that there are more games with complex features, but at times we want to play a game like this one, when the main focus is on the game play. And to be hones we would rather play a game that has features that are easy to activate in the first place.